I really enjoyed this latest episode with special guest online visibility expert Denise Wakeman. 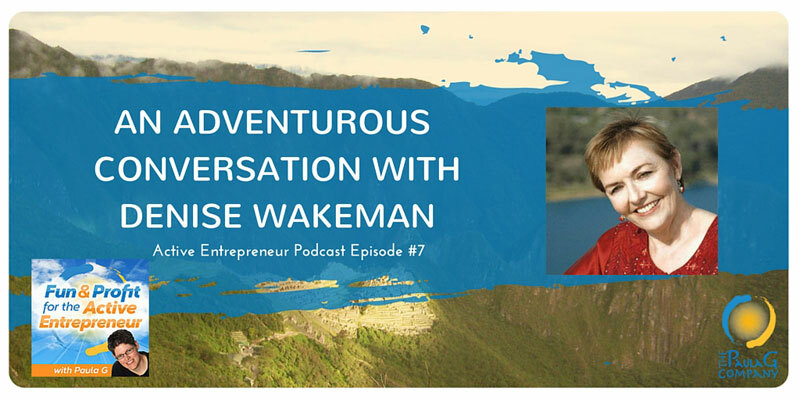 We talk about online visibility (of course) but more importantly we talk about some life-changing adventures Denise has had (like trekking to Machu Picchu) and how that spirit of adventure has changed the trajectory of her business. I’ve been blessed to learn from Denise for over a decade now: From my days hiding in the Corporate cubicle sneaking in a blogging teleclass to present day where I am honored to add some tech help to her visibility challenge students. What I love most about our conversation (and Denise) is how she brings adventure to everything she does. The stories of her trek to Machu Picchu inspire and leave me breathless no matter how many times I hear them or see the images. How she has transformed her business to align closely with her adventurous spirit is exactly what being an Active Entrepreneur is about. I particularly like the part of our conversation when she busts my own myths about whether introverts can create seemingly serendipitous opportunities from unexpected social/life situations. You’ll just have to listen in or read the transcript to find out what I’m talking about! The drool-worthy Denver car driving video. Watch it here. Link to Denise’s 6 month Online Visibility Challenge (this is an affiliate link – send some love to the podcaster) – If you enter the code paulag20 you will save almost 30% which is $200 (code is case sensitive)! Amazing photos and story of Denise’s trek to Machu Picchu in her blog post.